This clock was built in 2010 as part of a $14 million facelift to the Worth Avenue Shopping District. In Palm Beach, the nearest town to our city where most West Palm Beach residents and visitors always go to enjoy a day on the beach, there is a landmark that instantly becomes familiar to all. A person would hardly leave Palm Beach without noticing it or perhaps taking a photo of the Clock Tower at the entrance of Worth Avenue. 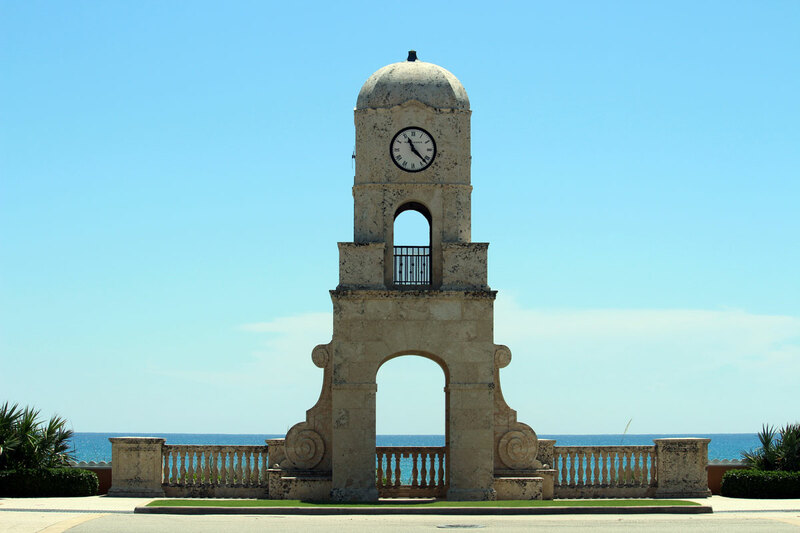 The clock sits right at the entrance of Worth Avenue, one of the main streets in the town of Palm Beach and it is facing both the avenue and the beautiful Atlantic Ocean that lies behind. 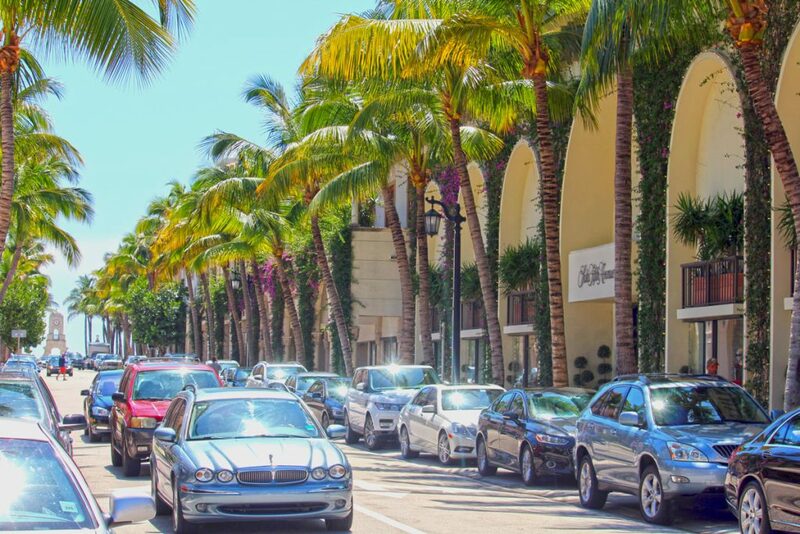 Worth Avenue is also the name of the main shopping district in Palm Beach and one of the most upscale shopping districts in America. Worth Avenue is among the three most iconic streets in America consisting of 4 blocks of fashionable high-end shops, boutiques, galleries and restaurants. Retailers in Worth Avenue are many of the world’s most influential ones in the industry, including: Neiman Marcus, Cartier, Louis Vuitton, Tiffany & Co., Tourneau, Hermès, Ralph Lauren, and Gucci among over 200 more. Worth Ave has been recognized as one of the 10 Most Iconic Streets in America. The clock was build right on the sidewalk of Old Ocean Boulevard. There’s a couple of palm trees on both sides a few feet away from the clock, leaving it majestically open to stand out in a way that it provides a dazzling view, specially when the sky is entirely blue. It is a landmark that serves to record memories of a trip to the beach in this archetypal town of posh lifestyle, artsy entourage, and sumptuous mansions. No visit to Palm Beach is complete without seeing Worth Avenue, the famous upscale shopping district in Palm Beach, and this clock neither goes unnoticed. The clock is also intended to be a monument to the Palm Beach Pier which stood on that site before it was destroyed by a 1930 hurricane. The construction of the clock was part of a $14 million makeover to the stylish shopping mecca Worth Ave in 2010 that also included wider sidewalks and palm trees lining up along the sidewalks. The clock symbolizes the fact that time may have changed, but that the half-a-mile Worth Avenue, called the Avenue by Palm Beachers, will always be an ongoing commitment to elegant consumerism. If you come to explore the labyrinth of pedestrian vias off the avenue, winding through tiny boutiques and water fountains passing by one-of-a-kind restaurants and unique shops on this prestigious district, remember your trip begins in this landmark Clock Tower at the entrance of Worth Avenue in Palm Beach. West Palm Beach Becomes Second City in America Completely Lit!